My little girl has an allergic reaction whenever I use diaper cream on her, so I have been using homemade diaper cream for a while. This one works especially well (and it helps yeast infections(mommies)). No chemicals on your baby's bum, just soothing, moisturizing, natural ingredients. In double boiler on low melt coconut and almond oil with comfrey, let it infuse for 45min to an hour. Strain through cheesecloth, throw away herbs and wipe leftover herbs out of pot. Pour oil back in pot, add beeswax and melt. Once all beeswax is melted, pour in jar and let it cool until just before it sets and mix in probiotics. Allow to fully set and enjoy the peace of mind that comes from puting chemical-free cream on your baby. 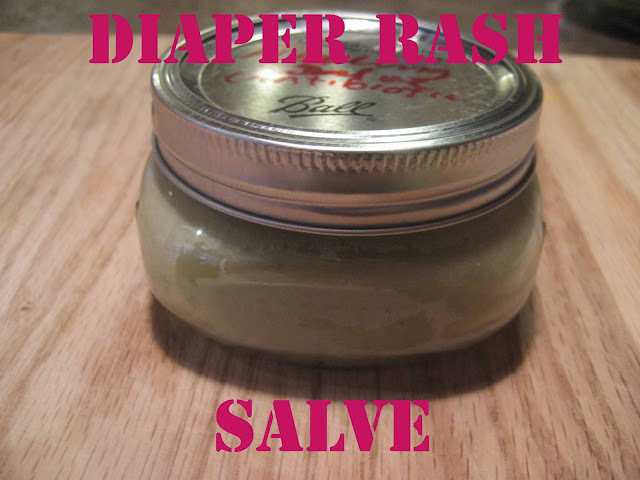 This salve is really good, I think I might try these cream over my little angel when she experience some diaper rash! nice and good blog. very informative.